[144 Pages Report] The global interventional radiology products market is expected to reach USD 8.02 Billion by 2021 from USD 6.35 Billion in 2016, at a CAGR of 4.8%. The major factors driving the growth of this market are rising incidence of chronic diseases, rising geriatric population, and increasing demand for minimally invasive surgeries. The global market is broadly classified into type, procedure, application, and region. Based on type, the market is segmented into stents, catheters, IVC filters, hemodynamic flow alteration devices, angioplasty balloons, thrombectomy systems, embolization devices, needle biopsy, and accessories. Based on procedure, the market is segmented into angioplasty, angiography, embolization, thrombolysis, biopsy & drainage, vertebroplasty, nephrostomy, and other applications. Based on application, the market is segmented into cardiology, urology & nephrology, oncology, gastroenterology, neurology, orthopedics, and other applications. Based on region, the market is segmented into North America, Europe, Asia, and Rest of the World (RoW). 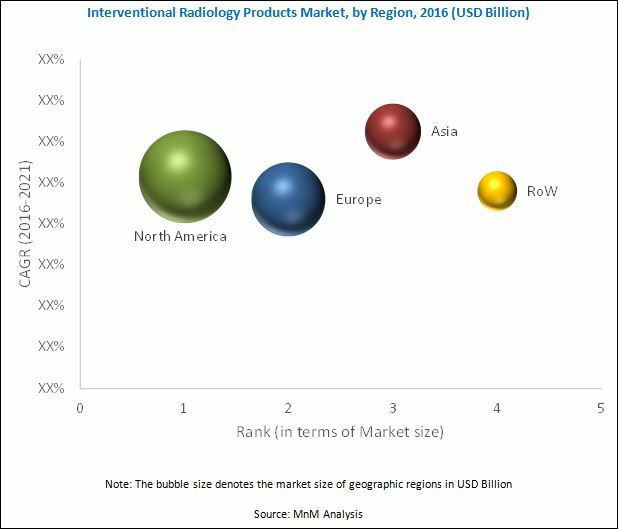 The major players in the interventional radiology products market include Abbott Vascular (U.S.), Boston Scientific Corporation (U.S.), Medtronic plc (Ireland), Cardinal Health (U.S.), B. Braun Melsungen AG (Germany), C.R Bard (U.S.), Biosensor International Group Ltd. (Singapore), Stryker Corporation (U.S.), Terumo Corporation (Japan), and Cook Medical Inc. (U.S.). This report aims to provide insights into the global interventional radiology products market. It provides valuable information on the type, procedure, application, and region in the market. Furthermore, the information for these segments, by region, is also presented in this report. Leading players in the market are profiled to study their product offerings and understand the strategies undertaken by them to be competitive in this market.